The band On These Airwaves “No Vox” record is an instrumental collaboration between two long time friends, Eric Long and Tom Yoder. Yoder is a two-time Independent Music Awards winner for his 2004 album “The Moment the Apple Falls” and his 2010 song “Locked In.” Long wrote and co-produced the majority of the songs on the “Sunset Provisions” and “Majors and Minors” OTA records. On These Airwaves’ music can best be described as cinematic psychedelic guitar based mood music. The duo wrote, recorded, and played all instruments on “No Vox.” The album consists of nine songs. The opener is the pleasing “Waterford,” an airy tune where multi-layered guitars are constructed around the framework of an arpeggiated synthesizer. Next, “Cannonball” has a super sleuth Peter Gunn feel. “Nine Lives” invokes Nine Inch Nails and “All the Comforts of Home” travels like a new Pink Floyd trip. The mood changes with the Mazzy Star sounding “Today After Tomorrow” and the joyous “Elfie Button.” The record takes an ominous turn with “Umbra,” and the cinematic “The Delphi Confluence.” The lush and reverb laden “Sleep On Titan” concludes the album like a pleasant dream after a restless night. Also… Michael Slear is the band photographer. The “Sleep On Titan” video was directed by Michael Slear and Eric Long. The “Nine Lives” video was directed by Reece Schietinger. "Sunset Provisions" is the 2009 debut album from On These Airwaves. The music was recorded at The Sound Hole studios in Myrtle Beach, SC. The record was produced by Michael Gardner and Eric Long and mastered at The Kitchen in Chapel Hill, NC. All songs were conceived by Long, who also wrote the lyrics. Musicians on the record were Long (acoustic, electric, bass, and slide guitars, percussion, vocals); Dave Atkinson (vocals, piano, keyboards); Michael Gardner (electric and slide guitars, vocals); Lewis Dickinson (bass guitar); Chuck Stokes (vocals and percussion); Charlie Newell (bass guitar); and Curtis Richardson (drums and percussion). The band's photographer was Michael Slear and George DuRant handled art direction. “Sunset Provisions” is a cinematic, cerebral post-apocalyptic pop record. If “apocalyptic pop” sounds oxymoronic, welcome to now. This reflective romp through youthful memory seems to say, “the past was never as good in the past as I thought it would be when I remembered it.” Upon reflection, what we “thought” was happiness is a promise that hangs in the air, and whatever happiness “might” lie ahead is accessible only by walking a live wire without a net. The segues ask us to visualize the normalcy of children’s voices and party chitchat, but the deep ambivalence of the present, of the room we sit in as we listen, magnifies the clash between youthful expectations and contemporary realities that characterize these songs. “Summer Swimming,” which you’d think would conjure youthful sunshine, freedom, and sensuality, comes across instead (as does the next track H.I.P with it’s inaudible voices from the cube jungle) like a paranoid reminder that we stand on unsteady ground: The song stutters before it can get back to the hook. “Who forgot the life preservers?” we ask. Those were the days, we say. Blue skies. Sun burn. Life is a suspended chord. By the time we get to “Ghosts See Me Sweat,” we don’t need the lyric to remind us that “sometimes things go bump in the night.” But the postmodern, post-crash postcard for the record is “Brains.” At first the repetition of “we all have brains” seems superfluous until we realize that the speaker needs the repetition, that the line serves the purpose of saying “Oh, yeah, I’d forgotten. We all have brains.” And the thing is, that acknowledgement feels like a victory. “Halcyon Days,” which is the soundtrack to whatever youthful memories you wish to supply, echoes “Aphelion” thematically, for it affirms that there were happy, joyous, carefree days of prosperity. But in the orbit of life, we now happen to be a long, long way from the sun. “Times” captures the difference between action and movement. “There were times when we ran with the ball,” it says; “Now, I’m just thinking, drifting.” But the song is not an unhappy one. Instead, it seems to say, “go slowly and wait for things to change.” And it is on this note that the record ends. “Free Trip” reminds us that each year we get a free trip around the sun, that at this very moment we are all traveling at sixty-five thousand miles an hour and that maybe for the time being that is enough. Although this may be a cerebral record that says, “don’t think too much about it,” it’s pop quality expresses a refusal to despair. Almost eastern in its meditative moments, it is also a lively listening experience. And if the lush guitar work suggests longing and memory, you’ll find that when you close your eyes you’ll tap your foot. In these ways this pop aesthetic expresses a kind of defiance that might be expressed like this; “I’d have a lot of fun-I really would-if there were any to be had.” While records at another time might say, raise your fist and shout “Hell Yeah,” the melodies here say “Raise your hand if you have a pulse.” This is music for dancing in a straitjacket. In the end, “Sunset Provisions” is a sonic cure. We’re just not sure for what. 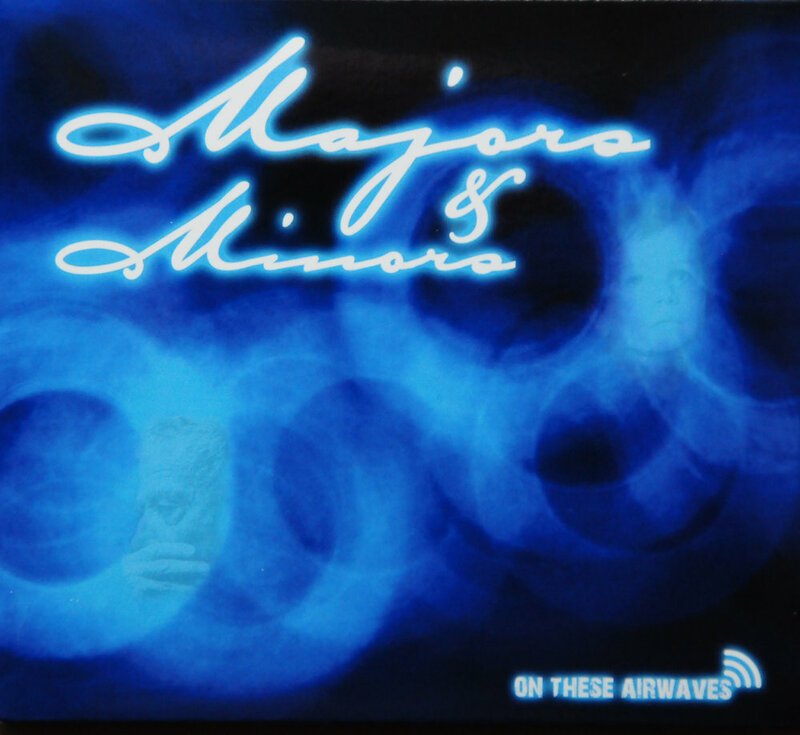 On These Airwaves' sophomore effort was the 2012 release "Majors & Minors." It was the second pairing of producer Michael Gardner and Eric Long. Like "Sunset Provisions," it too was recorded in Myrtle Beach, SC at The Sound Hole. The record was mastered by Wolf Mastering in Nashville, TN. In addition to Long's songs, Gardner penned three of the twelve and was a larger presence musically throughout the record. Dave Atkinson again handled most lead vocal duties while co-writing several songs. The record introduced future member, songwriter, and guitarist Tom Yoder. Kenny Soule played drums and percussion and Dave Adams rounded out the group on keyboards. Michael Slear snapped all photos and directed the “US” video. The “Perfect Circle” video was directed by Michael Slear and Eric Long. The “Break Me” video was a product of Koster Films. George DuRant was in charge of album art.